RepairDesk has recently added a new integration for SMS notification, Clickatell, which is a SMS Gateway through which you can interact and communicate with your customers wherever they might be. With Clickatell SMS integration you will be able to provide real-time personalized information to your customers across +1000 carriers in 224 countries and territories. All you need to do is create an account on Clickatell, get the API ID and place the information on App Page on RepairDesk. 1. First, go to Clickatell's website (https://www.clickatell.com/signup/) and create an account. Once you've signed up you will receive an API ID. 2. Login to RepairDesk and go to Settings. 3. Go to Integrations and click on the Clickatell SMS integration at the bottom. 4. Click on the Enable API checkbox and activate it. 5. Select Account type; Platform or Communicator. Note: After November 2016 update of Clickatell, two account types are offered: Platform and Communicator. All accounts created after November 2016 are Platform accounts and only API ID provided by Clickatell is required for Integration. All accounts created before November 2016 are Communicator accounts and you have to enter Business Name, API ID, Username and Password to enable integration. 6. Enter the API ID you received by signing up to Clickatell, and click on Save Changes. 7. In case you have a Communicator account, enter your Business Name, Username and Password as well. 1. While logging in to Clickatell, you will be asked to select account type: Communicator or Platform. 2.In case of Platform account, enter you email and password to login. 3. In case of Communicator account, enter your username and password to login. 4. In Clickatell settings, under SMS Integrations, ensure that RepairDesk Clickatell SMS Gateway Integration is enabled. To enable RepairDesk API for Clickatell, click on Create Integration. Enter Integration Name and Description and select Production Environment. Click on Next on all other steps. 5. Once Integration is listed, please make sure that it is enabled (see attached screenshot). And presto! Clickatell SMS gateway has been activated! Q. What is sender ID? A. A sender ID is an alpha-numeric number, ID or name which helps in identifying the sender of a SMS. Mostly it can be as long as 11 characters or digits. Q. Can I use my business name as sender ID? A. Yes you can. You can use any alpha-numeric number or name as your sender ID. However, Clickatell only supports sender ID in countries where it is a legal requirement. You can view the list of these countries from here. Q. Why I am unable to send SMS even though I have set up Clickatell integration properly? A. 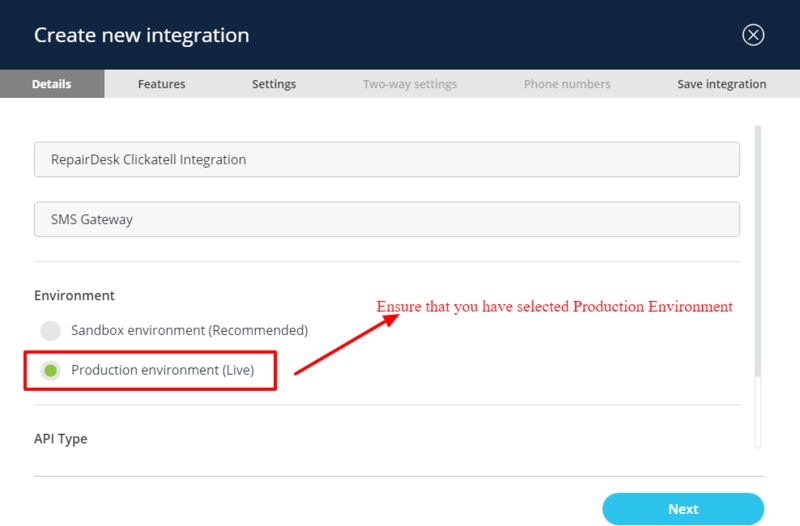 Please make sure that you have selected Production Environment and enabled Integration in Clickatell settings as shown in step 4 & 5. Q. How can I test settings? A. 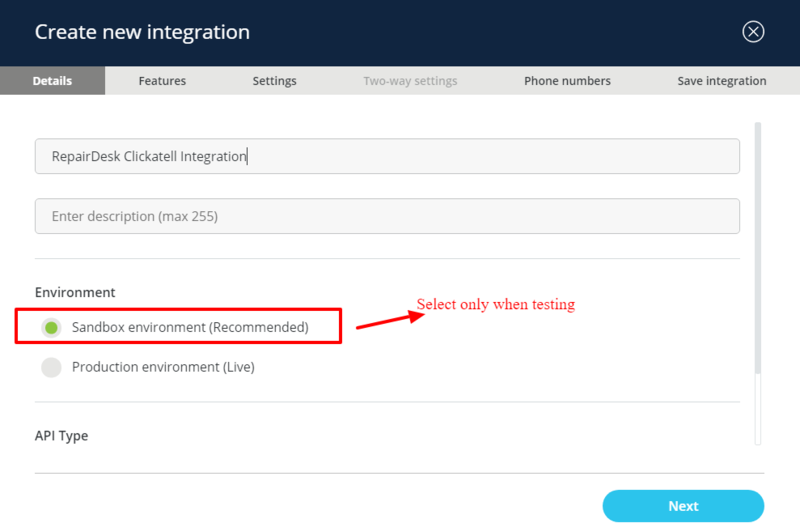 Create an Integration as shown in step 4 & 5 with Sandbox Environment (only when testing). Click on Next on other steps. Under Phone Numbers, select the number which you have added to Clickatell account for testing. All messages to this number for testing purpose would be free. Enable this integration. 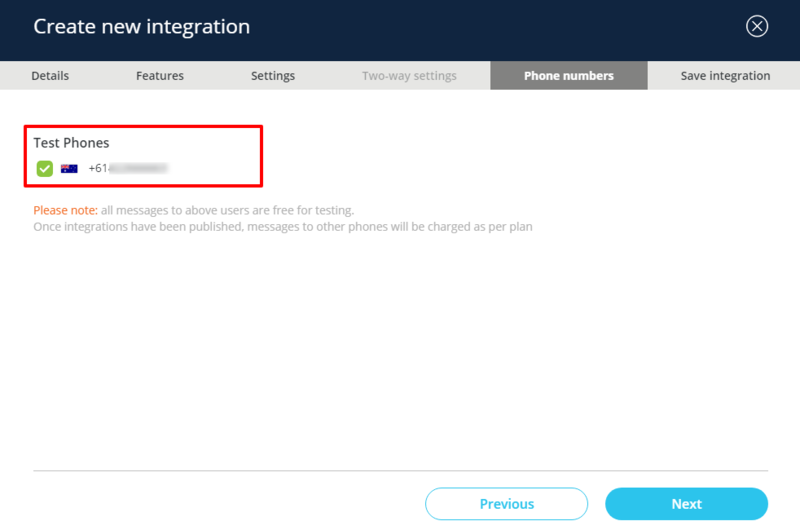 If you are receiving messages then your integration is set up correctly. Q. I'm unable to integrate Clickatell with RepairDesk is USA. Why is it so? A. If you are using Clickatell in USA, you need to have a two-way messaging account from Clickatell to integrate it properly in RepairDesk. Send 2 Way SMS Service allows mobile phone users to send SMS messages to your Clickatell account. This service may be provided via shared or dedicated short codes or long codes (“Numbers”). 1. Purcahse a two-way send sms service account from Clickatell. There are three options for you in choosing two-way send sms service: Your own long number, Random short code, Vanity short code which may consist of an appilication fee (one-time) and subscription fee (monthly) depedning upon your selected package. 2. While generating an API in Clickatell, please use the two-way send sms number in the API. 3. Login to RepairDesk and head to Clickatell Integration Settings. 4. Mention this two-way sms number in the Business Name field and mention the API Key in the respective field. 5. Save changes and you're good to go now! Q. How can we enable 2 way SMS using Clickatell?